Visits to hotel websites from smartphones (tablets not included) in many cases now represent more than 50% of the total amount. However, bookings made on these devices, although growing strongly, in 2017 “only” just about reached 20% of the total, going up to 30% in some destinations or hotels whilst not even reaching 10% in others. In other words, the conversion of mobile traffic is 2 to 5 or even 6 times lower than on a desktop computer. This coincides with a recent analysis by Fastbooking. It is also analyzed by Criteo in a recent study, with similar conclusions. – Why does this difference exist? 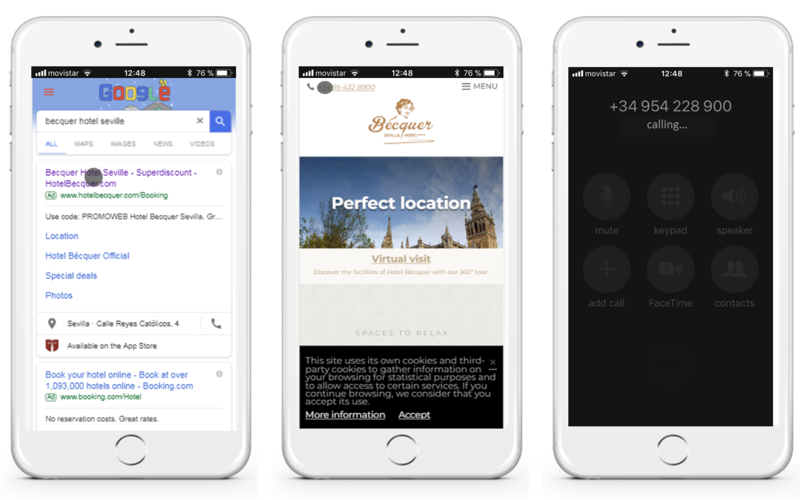 – Why don’t many visits from mobile phones result in a booking? – Is there a transfer of users from smartphone to desktop/tablet to book? – Why do some hotels have more sales weight from mobile phones than others? – Why do OTAs convert better on mobile phones than hotel websites? There are studies such as this one by MobileMarketer, this other one by TravelWeekly, or this one, for luxury hotels, which analyse these differences. Given that many of our clients ask us about this subject, at Mirai we have also analysed it from a business and also empirical point of view. Here are our conclusions, based on booking data from our client hotels in Spain in 2017, both urban and holiday. The first explanation is perhaps the simplest one and it consists in the use that we give our mobile phone. It has become a permanent checking tool that immediately answers our questions. 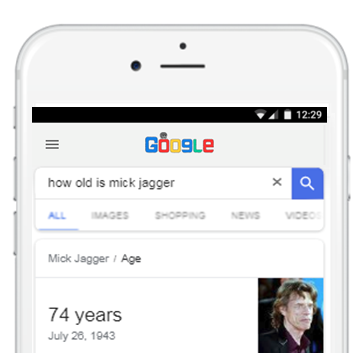 Who hasn’t asked Google (or Siri) “When did man first land on the Moon?” or “How old is Mick Jagger?”. We are now addicted to immediacy and constant checking. We also use it to check prices, compare hotels and gather information for future trips. We make the most of our free time or our commute to work and play with our mobile phone whilst watching TV in order to check things. Different studies confirm that the mobile phone is the device used the most in this initial “up in the funnel” phase (in comparison to desktop computers or tablets) and not just in the travel industry but rather in all of them. This is a general pattern. Most of these initial searches end up in nothing. Thousands of searches will never convert or may convert but probably in the distant future, making it very hard to trace that first visit. I myself often search for restaurants I want to go to (I already have my own wish list created) but I have only been to 10% of those on my list. The same happens with holiday apartments for summer or hotels for weekend breaks. I am a dreamer, just like everyone else. 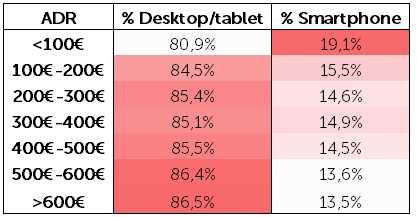 This difference in device use (mobile/tablet/desktop) in the different funnel stages partly justifies the big difference between views and bookings (in other words, the conversion ratio) on each device. 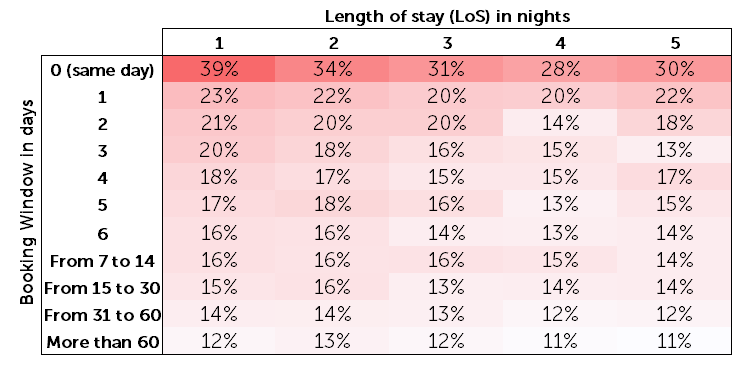 Quantifying it, however, is complicated and could vary in each destination or hotel. Who doesn’t use their mobile phone to search for a hotel address or to find their phone number and call them? Mobile phones sweep this category. All of this traffic, which is essential for the hotel, does not register any online conversion (online booking/view) on their website. Therefore, we should add other conversion objectives to mobile traffic. Calls to the hotel made from the website? Checks which go directly to the map or address? It’s hard to know and even more so to quantify but if we don’t take them into consideration, the contribution of mobile phones to your business is non-existent. After analysing all the bookings for 2017 (hundreds of thousands), the conclusions obtained show us similarities but also considerable differences among mobile and desktop users. Understanding them helps us explain more empirically “Why some hotels convert more on mobile phones than others” or, in other words “Why my mobile conversion is X or Y”. 2017 confirmed the trend that users who book on their mobile phone are becoming increasingly similar to desktop users. This is reflected on the gradual conversion of the following variables: ABW (average booking window), LoS (length of stay) and ABV (average booking value). It’s important to highlight that the average booking window does not decrease at the same pace as the length of stay. The reason lies in the other part of the variable, the price (ADR), which still varies a lot for mobile clients in comparison to desktop clients, as we will see later on. If we look at the data in more depth, we can see big differences in the behavioural pattern between mobile and desktop users. By comparing the ABW and LoS data, we obtain the following matrix of mobile bookings weighted over the total number. A highly different behaviour in both extremes. Little advance time and a short stay result in a greater use of the smartphone for bookings. It registered for almost 40% of single-night bookings for the same day. This is average data. In certain hotels, we accounted for peaks of up to 60% of sales coming from smartphones. Bookings made well in advance for long stays registered a low use of the smartphone. Only 11% of bookings for 5 nights or more 60 days in advance were made with a mobile phone. This represents four times fewer bookings. Another of the main behavioural differences is in the average booked price. The lower the rate, the larger the use of the mobile phone to book. As the rate grows, the use of the mobile phone decreases in favour of the desktop. Younger users (digital natives) tend to book lower rates than older users (higher purchase power). Spending more money requires doing things without rushing. Spending 80€ or 2,000€ on a booking is very different for many users who prefer waiting and booking it calmly and properly from their home or office. Lastly, another variable which could condition the use of the mobile phone is the market of origin. The obtained results are correlated to the average advance time, since the client’s market of origin tends to shape a specific advance time (flight planning, release of school calendars, etc.). As we have already seen, the advance time has a direct impact on the use of the mobile phone. 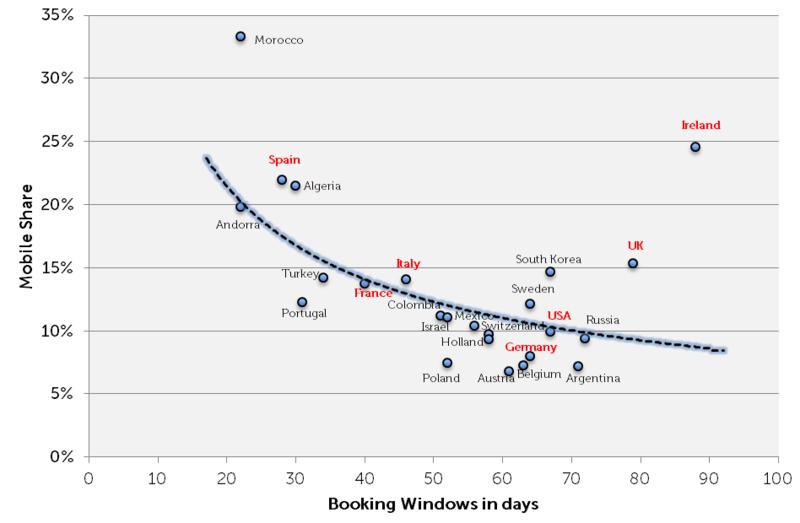 The data confirms that markets which book more in advance are those which have fewer bookings made from mobile phones. On the other hand, the nearest markets, which book less in advance on average, have a higher volume of bookings made from mobile phones. The behaviour of the local market (Spain) along with that of the United Kingdom and Ireland is above average. The client profile (age) or mobile phone use habit would justify this upward deviation. The three countries are among the European leaders in mobile phone consumption. France, Italy and the United States behave according to the average despite being, especially the United States, highly developed markets in the use of mobile phones. However, transoceanic markets are highly handicapped because the hotel booking is preceded by a long-distance flight booking which comes at a much higher cost than the classic low-cost European ones. Germany, a key market in destinations such as the Balearic Islands or the Canary Islands, instead behaves below the average, making this market once again an online sales exception, where it lags behind. Percentage of smartphone users who are comfortable researching, booking and planning their entire trip using only a mobile device. Source: Google/Phocuswright Travel Study 2017. In our study we have left out (since we don’t have the data available to us) a very important variable, which is the client’s average age. If we had this data, we believe that we would see a clear correlation between age and use of mobile phone. Why do OTAs have higher mobile sales than hotel websites? Firstly, we must clarify the nomenclature. 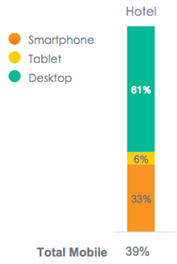 OTAs usually include smartphones and tablets when they are referring to mobile sales, as stated in the Criteo study. Therefore, it is important to compare equals. The data we have provided in this study excludes tablets, since we consider that their user’s behaviour is more similar to a desktop user than a mobile one. 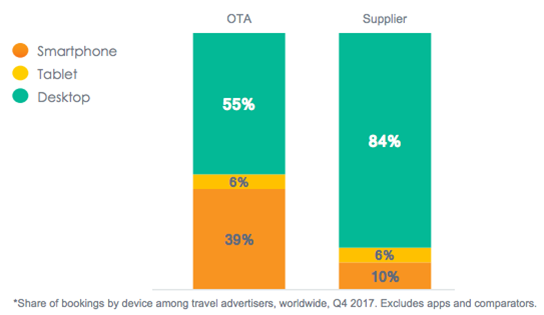 Even so, different studies, including once again the newest one from Criteo, show a big difference in the percentage of bookings made from smartphones between OTAs and hotels. Our data is far superior to the one showed there. The share of smartphone bookings in 2017 almost reached 20%. In more urban destinations, this figure reached 28% and up to 36% in some hotels. OTAs offer destinations from around the world. Your website just offers one (or a few, if it’s a chain). OTAs offer all (or most) hotels in the world. Your website just one (or a few if it’s a chain). Established brand image. More security to make the booking, particularly on mobile phones, where everything is more difficult and uncomfortable. More customer loyalty. In the absence of customer-loyalty strategies by the hotel, OTAs do it instead, creating users who are loyal to a brand or an app. Better user identification and data autofill. Comparing different websites on a smartphone is much more difficult than on a desktop computer. A client being redirected to a hotel website chosen by an OTA hotel or TripAdvisor is much more complicated, which results in the client staying with the OTA to make his booking. Facilitating payment methods, particularly for merchant models where the OTA is who charges the client. Powerful apps which captivate users even more. Users don’t use the mobile phone as much as a desktop computer. They are different stages of the customer journey. Also, users are cross-device and constantly go from one to the other. It is a matter of time that companies like Google or Facebook enter the traceability of cross-device users. You just have to look at the thousands of searches along the lines of “cross device tracking and attribution” on Google. This would really help us understand the differences in conversion between mobile phones and desktop computers. We would see with a higher degree of certainty that the mobile phone is the essential element in the funnel and that, therefore, its assisted conversion would be much higher than the last-click one. It’s easy to guess a mobile-phone sales share just by knowing your average client type. Analyse the variables that come into play in bookings made from smartphones: market of origin, advance time, length of stay, average price and, despite not having analysed it in this study, your client’s average age. This data will immediately explain why your mobile phone bookings share is what it is.